The beginning of July is perhaps my favorite time of year. Sandwiched between Canada Day and Independence Day is my birthday. We spend this span of celebratory days at the lake. There is so much that I look forward to in these precious days away from work and the city. We will spend hours in the outdoors, boating, swimming and lounging in the lake with family and friends all around. We will sleep in tents on the lakeshore and roast hot dogs, veggie dogs and marshmallows on a nightly bonfire. On the fourth of July we will drink gallons of Koolaid and eat an impressive, all-American spread at my family’s annual fourth of July Pot luck. There will be plenty of joking with cousins, Uncles and Aunts, and there will perhaps be a competitive all-ages game of volleyball with plenty of serious showing of bravado with spikes and high-fives. In the evening, Bjorn and I will venture into town with my cousins, spread out blankets on the grass, and eat candy and popcorn while we watch the fireworks. These are our traditions, some life-long, and others, new. The mood is celebratory, welcoming and lighthearted, and the attitude is “the more the merrier” when it comes to inviting guests, savoring summer pleasures together and finding new ways to have fun. This year we’re planning to dance up a storm at the Park Rapids street dance and rodeo dance during my cousin’s band Tree Party‘s nightly gig. This is our way of celebrating our two countries, my birthday, our family and our friends and savoring the simple glories of summer. These are the days that make our lives rich. Above are photos of my Mom’s flower garden and potted plants taken a few weeks ago. I am looking forward to morning tours of my parents’ garden and yard with a cup of coffee in hand. I can’t wait to see how things are growing and in bloom. I am hoping that a green thumb is hereditary. 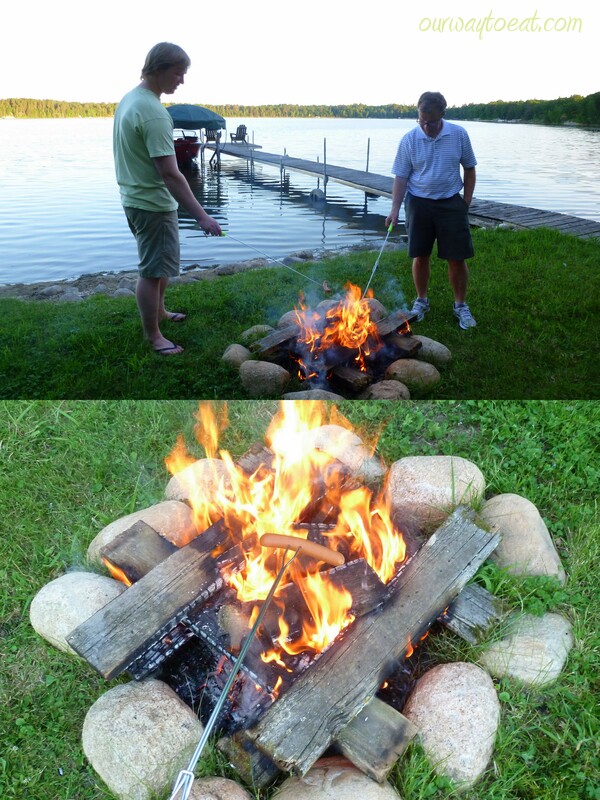 This entry was posted in Family, Omnivore, Our Garden, Simple, Traditions, Vegetarian and tagged 4th of July, Bonfire, Canada Day, hotdogs, July, lake, veggie dogs by Our Way to Eat. Bookmark the permalink. Have a fun time! We’ll definitely miss the festivities. So many great memories from last year. It was indeed the best week I have ever had in my life. Hands down. Thanks for helping make my early July so special! I feel privileged to have been able to share some of these special days with you and your family. It was the best week of my life. No joke. Hands down. I might just have to join you again next year!